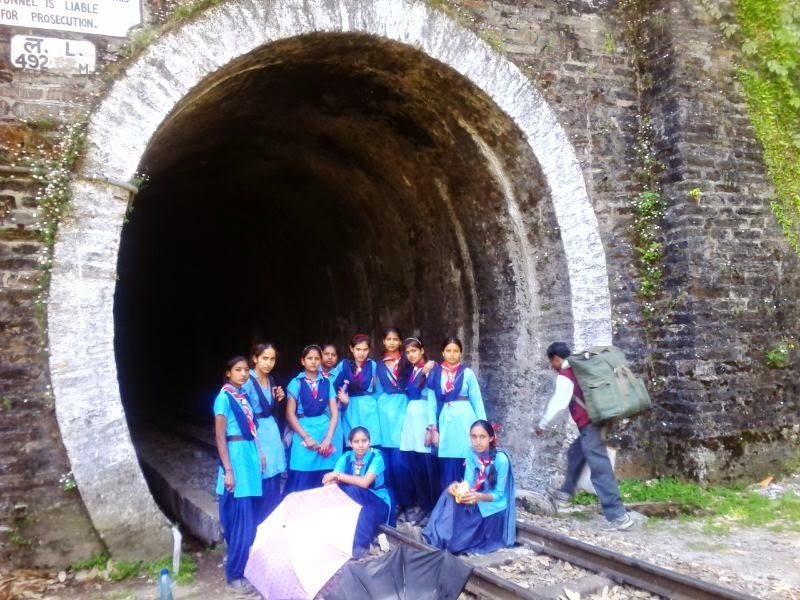 Award participants of Govt Senior Secondary School, Kot Fatta in district Bhatinda went for a trekking camp held at Tara Devi in Shimla under the expert guidance of Mrs. Harpinder Kaur Brar, our Award Leader. This was our first camp outside Punjab, and we were very excited. Our tour started on 19th May 2014 with a train journey from Bhatinda to Kalka, and then on to Shimla on the famous "toy train" -- our first experience on such a train. The scenic beauty visible from the train was something we had never witnessed before. There were mountains all around us and it felt as if the train was moving like a serpent in a wild forest of tall, green trees with monkeys swinging from branch to branch. After six hours of travelling we reached Tara Devi station. Then we went to our scout centre where we were offered lunch. After having tea and snacks in the evening we were feeling quite fresh and ready to begin our adventure. Our camp in-charge told us about the rules and regulations of the camp and gave all guidelines and schedule of the camp. Early morning of 21st May we started our day with exercise at 8 am after which we took our breakfast. There was halwa puri for breakfast and it was quite yummy. This was followed by playing outside games like cricket and football. Next day after breakfast we all were ready for our hiking and trekking programme. Everybody was charged up to climb the mountains. While climbing, students used sticks for self protection and to clearing their route. The track was quite steep and tough. There was thick jungle all around and it seemed as if we were passing through clouds. While trekking we also saw a helipad. Our instructor told us that water would be our best friend during the trek. We thoroughly enjoyed our trek and also the welcoming nature -- it was a lifetime experience. In the afternoon we reached the Tara Devi temple. After doing our prayers we took our meals and started our return journey back to our scout centre. On the third day, we had lots of fun participating in various activities like hide and seek, group activities, learning safety knots, tent pitching and a flag ceremony. All the activities were new to us. At night our teacher organised a camp fire and everybody participated in singing and dancing around the fire. It was as if we were in a different world. Next day we went back to Shimla, where we visited Lakkar bazaar. That is where we purchased gifts for our friends and family. We went horse riding on the Ridge and visited the Tibetan market and Sankat Mochan temple. While returning to our camp, everybody was very tired, we had our dinner and soon went off to sleep. It was on 25th May that we started our journey back to Bhatinda.This adventurous trip was the most unique journey we had ever been on, we learnt about parts of our life that we never knew existed. We reached our school with lots of new experiences and good memories from the trip. The trip was full of thrill and excitement. We will always cherish our trip.